Freed Italian hostage Giuliana Sgrena is helped out of the plane at Ciampino airport in Rome. Sgrena fanned a growing diplomatic rift between Rome and Washington by suggesting the US soldiers deliberately tried to kill her. The Italian journalist wounded by US troops shortly after her month-long kidnap ordeal ended, fanned a growing diplomatic rift between Rome and Washington by suggesting the US soldiers deliberately tried to kill her. Giuliana Sgrena, wounded when the convoy taking her to safety was riddled by US fire near Baghdad airport on Friday, said she may have been a target because the Americans opposed negotiations with her kidnappers. "Everyone knows that the Americans don't want hostages to be freed by negotiations, and for that reason, I don't see why I should rule out that I was their target," Sgrena told Sky Italia news channel on Sunday. The comment comes amid fears that Friday's incident, in which Italy's top intelligence officer in Iraq, Nicola Calipari, was killed, could lead to a full-scale diplomatic rift between the two allies. "The incident could have very serious political consequences," Italy's La Stampa daily said in a front page editorial, adding that relations between the two governments had "suffered an immediate deterioration"
Hour by hour, Washington's version of events was unravelling, the Turin-based newspaper said. The US military said their forces had given ample warning to the driver of Sgrena's car, which they said was approaching at speed when they opened fire, but Sgrena said they had not been travelling fast. 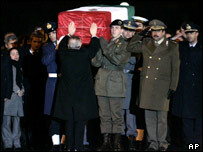 US Defence Secretary Donald Rumsfeld called his Italian counterpart Antonio Martino "to express the regret of the American administration and his personal regret" over Calipari's death, Italy's defence ministry said Sunday. Martino said he was sure that "the ongoing investigation will fully clarify the circumstances which led to the tragic end of this incident". Meanwhile, hundreds of mourners lined up outside the Vittoriano national monument in central Rome to pay their respects to Calipari, whose body was repatriated late Saturday. The crowd -- many carrying flowers and waving Italian flags -- applauded as his coffin was borne inside the monument where it was to lie in state until a funeral with full military honours on Monday. Italy's President Carlo Azeglio Ciampi hailed Calipari as a "hero" who had used his body to shield Sgrena after the US patrol opened fire. Sgrena was wounded in the shoulder and was being treated at a military hospital in Rome. Friday's incident is likely to rekindle debate in Italy over when to withdraw Italy's 3,000 strong military contingent from Iraq, the key condition laid down by Sgrena's kidnappers for her release. Much of the country opposed the original decision by Prime Minister Silvio Berlusconi in June 2003. Ruling party member Raffaele Costa said Sunday that parliament, which is due to debate an extention to the mission on March 14, should set a clear date for withdrawal. "It's time now that the responsible political forces define a way out that everybody can agree on." Communist leader Fausto Bertinotti said withdrawal of the troops would be a "act of public health, of real and political hygiene for our country". While Sgrena's suspicion she may have been a target for US firepower was not generally shared by Italy's press Sunday, an indignant La Stampa said the US government had been informed about her impending release. "And the presence of an American colonel at Baghdad airport along with the Italian officers who were waiting for Sgrena and her liberators, demonstrates that the operation was being conducted in harmony," the newspaper said. Sgrena, a 56-year-old correspondent for the Italian communist daily Il Manifesto, confirmed on Sunday that she had been voluntarily released by her kidnappers, but said she had no knowledge of any ransom payment. With most attention on the dramatic aftermath, little has been said about the circumstances of her actual release. Sgrena's account in her newspaper made it clear however that no force was involved, and that her kidnappers drove her to an obviously pre-arranged handover point. Pressure has increased on the United States to explain its troops firing on a convoy carrying freed Italian hostage Giuliana Sgrena, that wounded her and left one of her rescuers dead. Calipari will be given a state funeral Monday.